Warning: Do not exceed the working load limits for chain or components. Do not use for overhead lifting or hoisting. Designed for making quick connections with chain in industrial and construction applications.. Meets Grade 43 hook specifications. Manufactured from forged steel. For use with chain of an equal or lower grade. Not designed for over-head lifting. Warning: Do not exceed the working load limits for chain or components. Do not use for overhead lifting or hoisting. WARNING: DO NOT EXCEED the working load limits for chain or components. DO NOT USE for overhead lifting or hoisting. DO NOT USE if the chain or components are visibly distorted or worn. 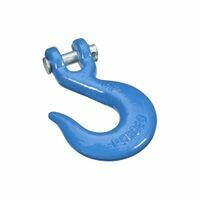 National Hardware Eye Slip Hook, Series: 3246BC, 5/16 in Opening, 3900 lb, Forged Steel, Blue, Grade 43 Hook Specifications, For Making Quick Connections With Chain in Industrial and Construction Applications Zinc finish. DO NOT EXCEED the working load limits for chain or components. DO NOT USE for overhead lifting or hoisting. DO NOT USE if the chain or components are visibly distorted or worn. Drop forged carbon steel. Designed with a full wide throat to allow for fast and easy connections. Chain is passed through throat of slip hook to form a chain loop used to drag, pull or tow, the loop will tighten when slack in chain is taken up. WARNING: NOT TO BE USED FOR OVERHEAD LIFTING. DO NOT EXCEED WORK LOAD LIMIT. National Hardware Clevis Slip Hook, Series: 3242BC, 5/16 in Opening, 3900 lb, Forged Steel, Blue, Grade 43 Hook Specifications, For Making Quick Connections With Chain in Industrial and Construction Applications Zinc finish. DO NOT EXCEED the working load limits for chain or components. DO NOT USE for overhead lifting or hoisting. DO NOT USE if the chain or components are visibly distorted or worn. WARNING: DO NOT EXCEED the working load limits for chain or components. DO NOT USE for overhead lifting or hoisting. DO NOT USE if the chain or components are visibly distorted or worn. National Hardware Eye Slip Hook, Series: 3246BC, 3/8 in Opening, 5400 lb, Forged Steel, Blue, Grade 43 Hook Specifications, For Making Quick Connections With Chain in Industrial and Construction Applications Designed for making quick connections with chain in industrial and construction applications. Meets Grade 70 hook specifications. Removable clevis is for easier rigging. For use with Grade 70 transport chain or with chain of a lower grade. Manufactured from forged steel. Not designed for over-head lifting. Designed for making quick connections with chain in industrial and construction applications. Meets Grade 43 hook specifications. Latch keeps connection in place until purposefully removed. Manufactured from forged steel. For use with chain of an equal or lower grade. Not designed for over-head lifting Designed for making quick connections with chain in industrial and construction applications. Meets Grade 70 hook specifications. Removable clevis is for easier rigging. For use with Grade 70 transport chain or with chain of a lower grade. Manufactured from forged steel. Not designed for over-head lifting. Designed for making quick connections with chain in industrial and construction applications. Meets Grade 70 hook specifications. Removable clevis is for easier rigging. For use with Grade 70 transport chain or with chain of a lower grade. Manufactured from forged steel. Not designed for over-head lifting. Designed for making quick connections with chain in industrial and construction applications.. Meets Grade 43 hook specifications. Manufactured from forged steel. For use with chain of an equal or lower grade. Not designed for over-head lifting. National Hardware Clevis Slip Hook, Series: 3243BC, 3/8 in Opening, 5400 lb, Forged Steel, Blue, Grade 43 Hook Specifications, For Making Quick Connections With Chain in Industrial and Construction Applications Designed for making quick connections with chain in industrial and construction applications. Meets Grade 70 hook specifications. Removable clevis is for easier rigging. For use with Grade 70 transport chain or with chain of a lower grade. Manufactured from forged steel. Not designed for over-head lifting. Drop forged carbon steel. Designed with a full wide throat to allow for fast and easy connections. Chain is passed through throat of slip hook to form a chain loop used to drag, pull or tow, the loop will tighten when slack in chain is taken up. WARNING: NOT TO BE USED FOR OVERHEAD LIFTING. DO NOT EXCEED WORK LOAD LIMIT. Designed for making quick connections with chain in industrial and construction applications. Meets Grade 43 hook specifications. Removable clevis is for easier rigging. Manufactured from forged steel. For use with chain of an equal or lower grade. Not designed for over-head lifting. WARNING: DO NOT EXCEED the working load limits for chain or components. DO NOT USE for overhead lifting or hoisting. DO NOT USE if the chain or components are visibly distorted or worn.